Are you guys sick of reading about bread making yet? I hope not. Trust me, if the internet had a way to transport smells, you would be drooling just as much as I am. So last week, I said I was going to make focaccia this week since I didn't have enough dough last week. I made this in the evening, so excuse the washed out pictures. 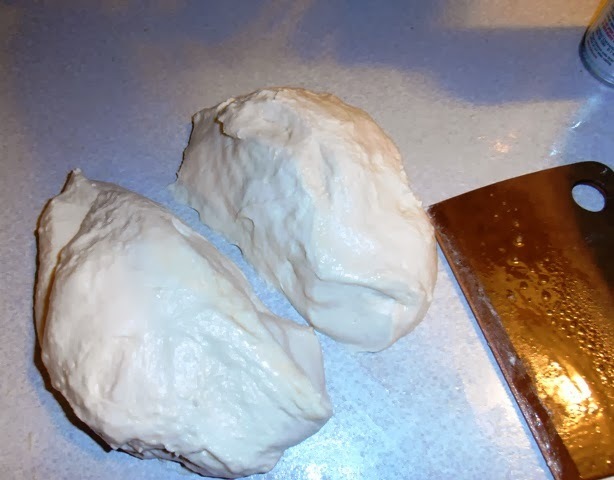 Here's the dealio, you start the bread dough same as ciabatta. 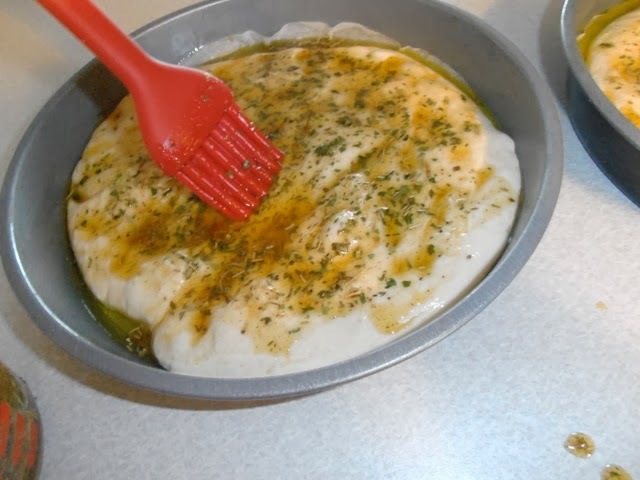 It's a slightly stickier dough than country style bread, so you use more oil to make it manageable. So, I mixed up the dough, and did the stretch and folds, handling it on a well oiled counter top. Then, I took my bench blade and divided it as evenly as I could. Look at all that oily goodness. Then you can bake it in pretty much whatever you like. I don't have a jelly roll pan. 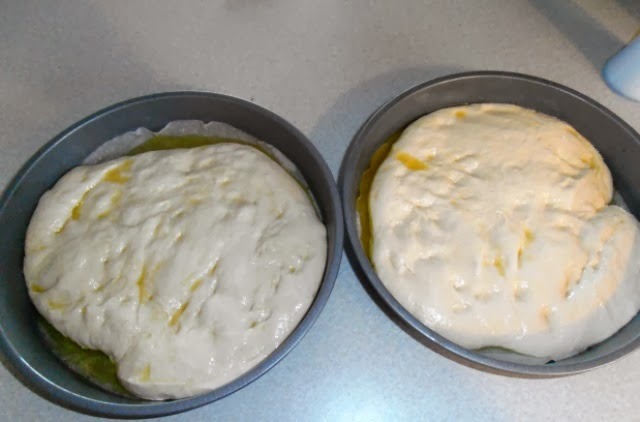 I have some baking sheets that have lipped edges, but according to Peter Reinhart, the class instructor, the bread should rise to 2.5 to 3 inches. So, I decided to bake them in my 9 inch round cake pans. I cut circles out of parchment paper to line my pans and spilled little oil in each pain to prevent sticking. I think I should be investing in olive oil as much as I've been using lately. Then I just covered them each with plastic wrap and put them in the fridge until I was ready to bake (it needs to sit for at least eight hours). They sat in the refrigerator about twenty four hours. When I pulled them out the fridge, I smushed the dough out as much as I could. It resisted a little but was fairly easy to work with. Now, just waiting for it to warm up. 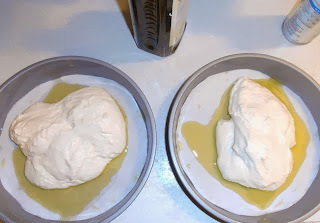 While, I waited for the dough to warm up, I mixed up my herbed oil. The class printout comes with a recipe so I kind of followed that. It has basil, parsley, paprika, rosemary, oregano, garlic powder, thyme, salt, and pepper. So, I mixed that up, but you can make yours with whatever you like. 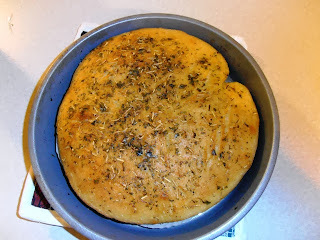 Then I pushed the bread to the edges of the pan and then brushed with the herbed oil. So, then you just let it rise on the counter for a couple hours. I think mine sat out about two and half hours before I through it in a 450 degree oven for about twenty minutes. And this is what it comes out looking like. Notice the unintentional beauty mark at the 2 o'clock spot? So how'd it taste? Not like any focaccia I've had before. I'm used to cutting focaccia with a pizza cutter, basically pizza crust with herbs and oils. This is more like a traditional bread. I think it'd be super tasty sliced in half through the middle to make two big circles and then fill with sandwich fixings for a big party sandwich. It was good tasting. I liked the herb flavor. And, all that oil made it have a crispy outside with a super soft inside. Next time I may try to cut down some of the oil, just to make it a little healthier. To boil it down, it was good, but I liked the ciabatta better. 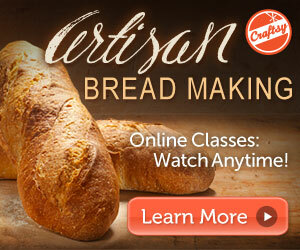 And of course, if you want to try your hand at artisan bread baking, I can't recommend my affiliate, Craftsy's, Artisan Bread Making Class enough. Check it out.